Split PST - Organize Your PST File in a Better Way! October 8, 2015 April 7, 2018 Vaibhav SComments Off on Split PST – Organize Your PST File in a Better Way! MS Outlook has become a global email sharing application and its “advance features with simplicity” trait has made it more popular. But management of its storage data file has to be done by the user to maintain this application working properly. Split PST is a tremendous solution to attain this management in best way possible. What this software does is, it breaks the Outlook storage file and splits the data inside to different files. Thus, the data is available in slots in different PST files. The splitting of the data can be done on the basis of various categories available in the application. There are many other options available which can ultimately help to enhance the splitting operation. The service allied to this tool is also amazing and the whole processing is controlled and feasible. The below section will review some of the pros and cons you are going to get if you invest in this application. How to Get Split PST Software? The very first question is how to get this tool and access it. This Split PST solution is available online and can be downloaded from the main site. Software comes just like any other online available software as an executable file. It can be run and application will start installing. Once it is installed it can be run as any other software program. The software which is installed is demo version and has several restrictions on it. This demo version can be converted into full version by purchasing license key according to the license wanted. This can be easily done by contacting support team members. The whole process is very smooth and absolutely hassle-free. This easy installation makes this software even better. You Get Extremely Helpful Support! It is always suggested to procure online software solution which is backed up with an expert technical support. This is to make sure that if you are stuck with any issue, there is a trustworthy resource to get help from. Split PST comes from a reliable brand and its support availability is simply awesome. What you have to do it chat or call on the toll free number and you will get help from them. This service of this application again makes it a worth investment. Divide By Size: Software allows splitting the Outlook PST file according to the size of the PST file. For this, you will have to provide the size in GB after which you want to split the file and the file will get divided accordingly. If growing file size of your MS Outlook storage is the only issue with your PST file, you can go for this option and divide your PST file according to its size. Divide By Date: This option can be beneficial if you want to organize email data as per dates. For instance, if you want to maintain emails belonging to different projects issues on different time phases you can go for this option. The result of this option will be creation of two files; one is file carrying data before the date provided by you and another file with data belonging to after the date. Divide By Year: This is another interesting option using which one can divide the PST file data to various PST files as per the year. You have to provide the years and the data belonging to these years will get split into PST files. It is again a very beneficial option and allows splitting PST file year-wise. Divide By Folder: There is also an added option of dividing PST folder-wise. Here you have to provide the size and then the folder exceeding the provided size will get split automatically. Thus size of particular folders individually can be managed. How is Split PST Beneficial for You? 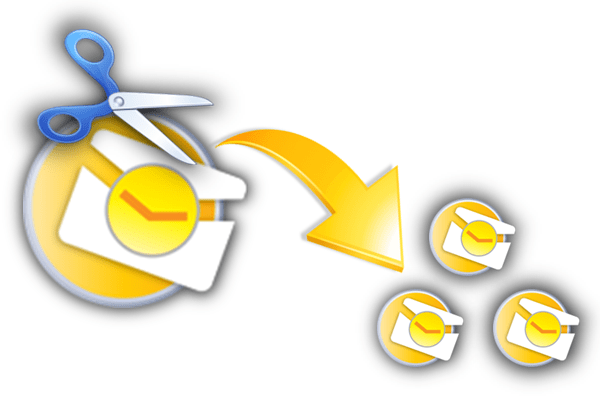 Break PST in Organized Way: The splitting function is done in an organized manner and none of the emails or any other email data is misplaced or lost. There is also no alteration made with the existing email data and its attributes. Interface Works For All: Split PST has an easy to understand and self-instructing interface and thus any type of user can use this application. It is a feasible tool and needs no extra help to run it. Every step is simple and thus software is very suitable application. Unmatchable Technology: Split PST might appear simple at its working but is very much powerful at the backend. Effective coding has been used and it is visible through the outcome this application gives. Strong Grip on Processing: Split PST has strong hold on the processing of the PST cutting technology. The predefined data for splitting in GB, Year, etc. is read exactly by the tool and the processing of splitting is done accordingly. There is no blemish in the resultant PST file. Works on ANSI and Unicode: Split PST supports both types of PST files belonging to all the MS Outlook versions and thus there is no complication over the type of PST file or version it belongs to. Split PST has an impeccable working strategy and the overall performance of this application is admirable. It is a sure shot method to Split Large PST File according to multiple categories. Software supports PST files belonging to large size as well and splits all the data; emails, calendars, etc. This software however does not support corrupted or damaged PST files, and thus cannot serve users who have damaged PST files. But users cannot ignore the rest of the facilities it provides. I will rank this tool as 4.7/5!